As an avid runner, I burn through shoes. Some people who Know Things recommend retiring running sneakers after 300 miles, some say up to 500 miles (I tend to retire them when the tread on the ball of the sole wears so much so that I can no longer see the original grip-pattern). Since I'm a thrifty individual, I do not want to spend $100 every 3 months on new sneakers. I know that shoes are important, but I'm cheap. So I scour the sales. I know my size in many brands, I'm no longer particular about brand or model (I used to be exclusively Brooks Adrenaline, until they altered their sizing and I had two pairs of shoes wear through on the top fabric over my pinky toe). I normally get my running shoes from Running Warehouse. Their sale shoe section always has something, and I will order before I need and store the new kicks in my closet for when they're called upon. With the help of Retail Me Not, I can buy a pair of decent running sneakers for $60 or under (which, is a steal TBH, especially because they offer free shipping both ways, and their return process is a breeze). However, my most recent shoe purchase was from Under Armour (I had no idea Under Armour even made running sneakers until last year). Fitness/running and writing are a big part of my life, which, combined with my general job-restlessness, means I apply for copywriting jobs at sports brands often. One of the nice practices is that sometimes these companies offer a discount coupon code to thank you for your application (and who doesn't enjoy crying about rejection while wearing shiny, new gear?). I recently applied to a job at Under Armour with their Run division (which I would have crushed, because they miss the mark with running apparel, but neither here nor there), and they thanked me with a 35% off coupon code. I then used this code and purchased a pair of Charged Bandit 2 for $36. I mean come on, $36 for a pair of "good" running sneakers is amazing, and unheard of. To say I was skeptical of UA's ability to make a "good" running shoe would be an understatement. Without going on a tirade (and sounding bitter about not getting the UA Run job) I'll say that UA makes running clothing for people who run on treadmills (nothing against treadmills, but UA apparel is often more about being seen and advertising brand loyalty, often at the cost of function and comfort--not to mention the vanity sizing that doesn't exist elsewhere in the competitive sportswear industry). However, I was pleasantly surprised. 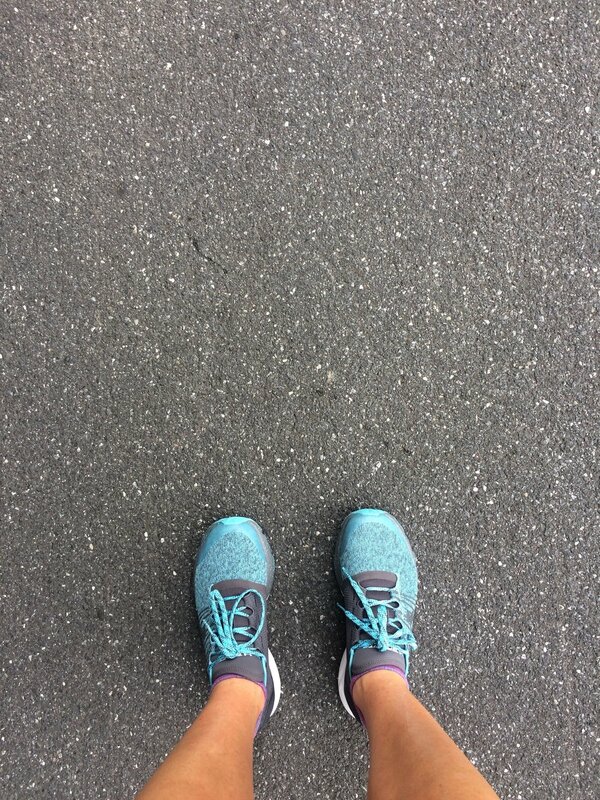 I took the new kicks for a 4.5 mile test drive this morning, after wearing them around the house and deciding that the fit was okay (I wear a 7.5 casual shoe, and am basically a 7.75 in running shoes--which until Adidas equips every store with a 3D printer for custom shoes, is my cross to bear). I ordered an 8 in these shoes after reading reviews to order 1/2 size up, and cross-referencing my UK/EURO/CM size with UA's sizing (seriously, you should all be doing this if you're ordering shoes on the internet). I don't care much about the aesthetic of my running shoes, I am much more into the function, but I got a bunch of compliments from friends when I sent the obligatory unboxing snap. The cushioning on these shoes is EXCELLENT. Seriously. I know I only ran 4.5, but they felt great. I'm interested to see how these hold up on a long run (10+ miles), but want to break them in a little more before trying. The downhill on my run felt fine, no knee issues. In addition to the cushioning, these shoes had a great response. I felt like they were helping my foot push off each time it landed. I'm going to compare the stability in these shoes to the Brooks Adrenaline, aside from the slightly higher arch, the motion-control felt very similar footfall-wise. The price, seriously $36 is bananas for running shoes. The sizing: I am hoping that after a few runs they stretch out a little, but as of now, they are a little more snug than I am used to for a running shoe, but that could just be the fabric of the upper. The fabric of the upper reminds me of Patagonia's "better sweater" fabric in that it is a marled knit that conforms to your foot. I've seen Nike's with this fabric--kind of like the fly-knit. I know that an 8.5 would be way too big, and I'd rather hope to stretch these out than deal with too-big blisters. I am worried that this knit fabric will get stinky. The gray fabric on the arch-side of the upper is almost solid, and I definitely think they will hold smell. I don't know if this is because I wore a sock that didn't work well with the shoe, or if it's the fly-knit conforming design of the upper fabric, but my feet slid around a lot. Maybe I should try wearing them without socks? I am also skeptical about the lacing system. These shoes don't have the typical holes for your shoelaces, they have fabric folds, and I am concerned about what will happen if the fabric rips. I normally only single-knot my shoes. I know, it's crazy, but with the advent of flat shoelaces, one doesn't need to double-knot. I never have any problems with my New Balances or Brooks when I single-knot, but with these, my right shoelace came untied 4 miles into the run. I know I should just double-knot like most people, but maybe UA could use a rougher fabric for their laces. Though they have flat laces, they are very soft, and I think that is why the knot slipped and came undone. The Bottom Line: I obviously am keeping these shoes. Unlike how Under Armour treated my application, I am willing to give them a chance. Plus, for $36 how could I not? I think that if you are used to the minimalist design of shoes that use the fly-knit type fabric, these would be an easy transition. The newer version of these shoes are a Runner's World Editor's Pick, so maybe they've improved on the flaws I pointed out in my Cons. I do think that Under Armour can make a product that competes with the more niche running specific shoe brands, but I think they need to embrace the running community a little more (and realize that Runners are very different than People Who Go To The Gym And Workout).